The technique is called convolution, and it uses the power of digital audio theory to combine sounds, as if one is heard “inside” another. And if you’ve heard of it before, you probably associate it with reverb – rightfully so, as you can produce highly detailed, realistic reverberation with the technique. But as celebrated film and TV composer Diego Stocco has shown us previously, you can use that same potential to create sounds that would be otherwise impossible. And it means you can fuse the sounds of a synthesizer with totally unrelated sounds to create something unlike you’ve ever heard before. 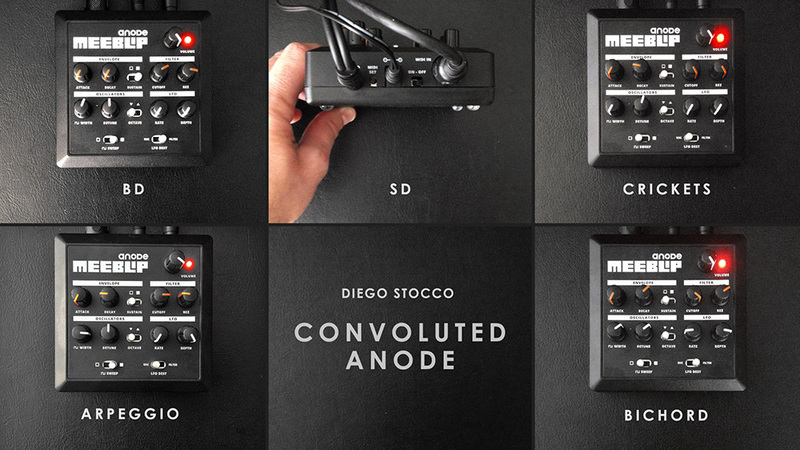 Diego Stocco recently picked up our own monosynth, the MeeBlip anode. Let me be a bit humble here for a moment. The hardware alone really doesn’t do the work. We tried to make a synthesizer that has its own personality, that inspires people. But it’s really a lot to do with the musician who picks up what we designed: Diego makes sounds with anode that sound like him, that don’t sound like just another analog monosynth – gorgeous, droning detuned hums reminiscent of a just-discovered, ancient folk instrument. With MeeBlip anode, every aspect of the hardware became the starting point for something new – even the sound of turning off the power supply. The deep intonations of anode’s pitched sounds become a dark, pulsating hum. Higher harmonies buzz like bees, the edge of the analog filter turning into odd, otherworldly colors. Others become pitched, but sound like the resonance of some hitherto-uninvented synthetic material from the future. Alien insect swarms? Check. The inside of the lungs of an android? Got it. And yes, you can even work with some of the sounds as reverbs, but different in timbre than what you’d normally here. You can try out these 15 sounds for free, using any convolution processor that accepts audio files as impulses. On Ableton Live Suite 9, for instance, you can drag and drop these onto the new Convolution Reverb and Convolution Reverb Pro. (The “Pro” version even sees the whole folder as a collection.) The Space Designer Pro in Apple’s Logic works nicely, as well. Freeverb is an open source option and includes VST builds. 15 sounds is already a lot to start with; I barely got round to writing this article as I got distracted listening to even some semi-boring default drum loops in Ableton Live through them. Feeding rhythmic material works really well, either mixed or completely wet, and that’s just as a starting point. I now also have to hook up my own anode and try capturing impulses; there’s no way not to be inspired by this if you’re addicted to sound design. Still, I love listening to Diego’s own compositional ideas. Here, he applies this and his other libraries to a music track. Keep listening – it starts minimal, then heats up. Shameless plug, but because we haven’t mentioned it much: yes, you can now buy a MeeBlip anode anywhere worldwide. They’re also gradually arriving in dealers in North America and Europe. But back to not spending money, just enter your email address and you can download all the WAV files (24-bit) for use as impulses. If you don’t want to donate to Diego, just type a ‘0’ in the amount form and the fields for your credit card information magically disappear. I’d be really interested to hear tracks made with this, so get in touch if you use them. And let us know if you discover other convolution techniques or try making some impulses of your own.